GDPR goes into effect later this week, and companies across the globe are getting ready for a new era in data protection. To help companies operationalize their ePrivacy and GDPR compliance, OneTrust is bringing new features and updates to its Cookie Consent and Website Scanning solution. Backed by deep research, the updated solution includes expanded website scanning features, new user interfaces and expanded reporting capabilities. OneTrust’s cookie solutions are used by thousands of web and mobile sites earning billions of impressions globally. With a new era of data privacy regulations coming into effect, website owners and operators are facing extensive compliance challenges. These new obligations require organizations to inform their visitors about their website’s data collection and tracking policies to provide improved transparency, control and choice. Expanded Website Scanning and Automation: OneTrust can now scan behind login forms and age verification pages. Scan can also be on the entire website, or based on a sitemap file so only specific pages are scanned. OneTrust then automatically categorizes the cookies into group and subgroups based on the OneTrust-owned Cookiepedia database of nearly 6 million cookies, and users have the ability to re-categorize if they wish to do so. New User Interface Options: In addition to the traditional cookie banners, we now offer a new overlay user interface to prompt the user to accept/decline cookies before using the site. These UIs were developed based off A/B testing to maximize the number of users consenting to cookies. OneTrust UIs will also honor “Do Not Track” preferences. Easily Translate to 35+ Languages: Cookie notifications can now be automatically translated to 35+ languages based on the user’s browser preferences with just one line of script. To learn more about our Cookie Consent and Website Scanning Solution, read our press release and visit our webpage. OneTrust also partnered with the International Association of Privacy Professionals (IAPP) to offer organizations free access to our Cookie Consent and Website Scanning platform. The upgraded platform has also been made available for IAPP members in their IAPP resource centers. I applaud the cookie management solution of @OneTrust. Very well done. If you want to see how it works, go to https://t.co/KtG5EGboe5, then in the bottom part of your screen click on 'cookie settings'. 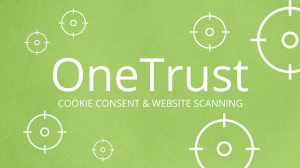 Bloggers: I am in love with @Onetrust cookie scan/apps for GDPR compliance! For additional information or to request a live demo or e-mail us at [email protected].